For two-plus years I worked on my LOST reading challenge before starting this blog. I have come to the last book of the reading and I have decided that I want to try and review all of the books. Some of them won’t be easy because it’s been so long since I’ve read them. This should keep me occupied over the summer while I make plans for my big LOST Book Club Celebration. I’m planning it for the fall cause I need to save up some moo-lah. 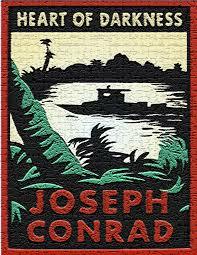 So first up on the pre-blog books is Heart of Darkness. This is one of the first ones I read for the challenge. It was free on Kindle and I was glad to see it was a short one. I never read it in high school and I was never really interested in reading it in adulthood, but thanks to the good people of LOST and to Coyote Mercury, it wound up on this LOST Book Club list. And really, it wasn’t so bad. Truth be told, I didn’t follow everything, and I didn’t do much research on it other than reading a few summaries and talking about it with someone, but I think I did ok with it. 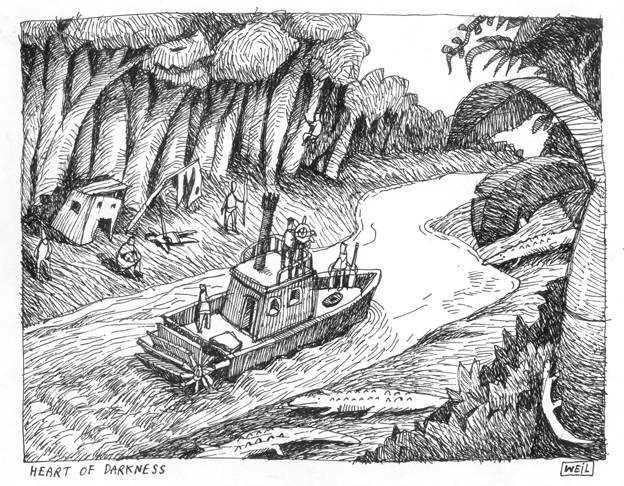 It’s basically the story of Marlow, a man who is a river boat captain, employed by a European trade company, who is traveling up the Congo River to find Kurtz, a leader in the company who lives at a station deep in the jungle. Marlow is coming to rescue Kurtz because it is rumored that he has fallen ill. Marlow has heard all kinds of fabulous and impressive things about Kurtz and he begins to idolize him before he ever meets him. Unbeknownst to Marlow, Kurtz has convinced the natives that he is a god. He has taken advantage of them and turned them into his slaves. When Marlow finally arrives at Kurtz’s station he sees a line of poles stuck in the ground at the rivers edge with heads perched on top. The truth becomes painfully clear to Marlow of what Kurtz has been up to. Needless to say, he is disappointed. And to tell you the truth, I was disappointed too. I’m sorry to expose my shallowness here, or maybe it is my own darkness, but I really thought I was going to get to read about all that head chopping. I thought I, as the reader, would be exposed to the process of Kurtz’s descent into darkness. And I assume that it was a descent into darkness and not his original intent. Who knows? Some of you scholars may know. Marlow does a really thoughtful thing at the end and that was nice because he had become pretty disillusioned. There were moments in the book that were a little bit scary. At some point in his journey up the Congo River, Marlow is traveling with cannibals. I thought we might see some of that in action too, but thankfully not. There was lots of fog at one point and the ship is attacked by natives from the shore. Heck, the whole idea of being in a wild jungle, living among cannibals, and getting deathly sick is pretty scary any way you look at it. It would be nice to sit in on a class with this one. I felt that way about several I’ve read for this challenge. I would love the opportunity to soak up all the goodness and meaning of a book by someone who knows it well and with others reading along. There is a lot of political or philosophical meaning in the under current that you miss when your just reading it to check it off a list. Good question Jack. She is forever in the middle of what the rest of the guys are up to, getting their back when needed, yet she can still sew up Jack’s gaping wound after the crash and deliver Claire’s baby in the jungle. (And some people thought Kate was useless). There are obvious connections to the jungle and the scary things that lurk within it. No cannibals on LOST though, and no severed heads. Except on some old skeletons. I’m sure the connections go way deeper but that’s as deep as I’m going. If you want a much better analysis of the book and it’s connection to LOST, skip on over to Coyote Mercury’s review, here. You’ll be enlightened and engaged. Great to see you going back and blogging the pre-blog books, and thanks for the link! Ha ha! I remember that list of the shelf of shame.